I heard many volunteer stories from other travelers on my trips. However, not until quite recently I had looked into doing it myself. I signed up for 2-weeks of volunteering on a truffle farm in Asturias, Spain. Doing volunteer work abroad opened up a whole new dimension of travel. It didn’t feel like work, but it would give me a great sense of (temporary) purpose that I sometimes lacked on longer trips. And of course, given that I had done enough research into the organization or individuals, I would be helping someone else as well. Why would I do volunteer work abroad? If you are planning to travel for a longer period of time (say, a few months), it might be worth looking into breaking it up by doing some volunteer work abroad. Travelling can be exhausting, especially when you are hopping from place to place using local transport. I remember more than once just wanting to sit on a couch for a few days. Then again, the idea of sitting on a couch while I “should be” exploring the world didn’t sound quite appealing either. Ah, the old paradox of intense travel. Doing volunteer work abroad is, in my opinion, an excellent excuse to slow down your travels without falling into a void of having no purpose (or at least, feeling like you don’t). I was interested in the range of volunteer experiences out there and if there would be a positive or negative sentiment around them. So, I asked a few lovely travel bloggers to share their volunteer stories. To help stretch our travel budget, Craig and I (Gemma) completed a handful of volunteer programmes with the work abroad site, Workaway. Don’t get me wrong, the majority of the opportunities were great. We lived on a family farm in the Hungarian countryside, I taught English to foreign business people (yes, Scots speak English), and we helped a young Argentinian couple in the daily running of their boutique beach hotel in Nicaragua. But there is one programme that we just have to laugh at. It was close to the end of our long-term trip and we really could not face living with a family but the guilt made us go to Granada in Spain to help a sick Mum look after her child. When we arrived we quickly discovered that the Mum had made a miraculous recovery, the medicine? Love. She had left the husband (who didn’t seem phased) for the (very) young ex-Workaway. The pair were now shacked up in a love nest elsewhere with the kid. This actually worked in our favor because childcare duties were minimum, all we had to do was walk the four (otherwise ignored) dogs three times a day, clean the house and cook dinner. Winning! Tip: although you can read the reviews (and you should before applying) for each programme there may be the random one like this that you can’t quite control! I was backpacking through Southeast Asia when I stumbled on a poster advertising a volunteer job in Thailand. 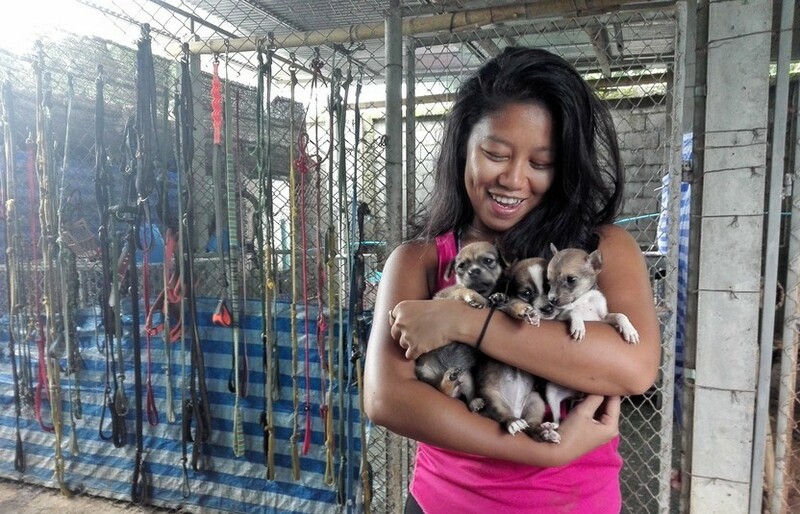 The organization, the Baan Unrak Animal Sanctuary, is a shelter that rescues abandoned, sick, and mistreated dogs and cats. Once the animals have recovered from the trauma, the sanctuary works very hard to find them a new and suitable home in Europe, North America and other parts of the world. The shelter also offers free vet services for any animals in need. The shelter runs on donations and volunteers and there is no fee to join the program. However, due to lack of budget, volunteers are responsible for paying a fee of $3 per night for their accommodation. There is a free lunch at the local school during the school season. Volunteers spend their days taking the dogs for a walk, feeding the dogs and the cats, building and cleaning pens, and playing with them. The stories of how the animals get to the sanctuary are heartbreaking. I volunteered for less than a month but my heart was captured by all the loving dogs and the people who run the place. When I left the shelter a piece of my heart was left behind and one day, I will be back. If you have some extra time during your trip or looking to do something very different from other travellers in Southeast Asia, I highly suggest you look into volunteering here, even just a week or two. If you are a licensed vet or a student vet, your effort and time will be also needed by the many animals who have been abandoned, hurt, and left by their previous owner. 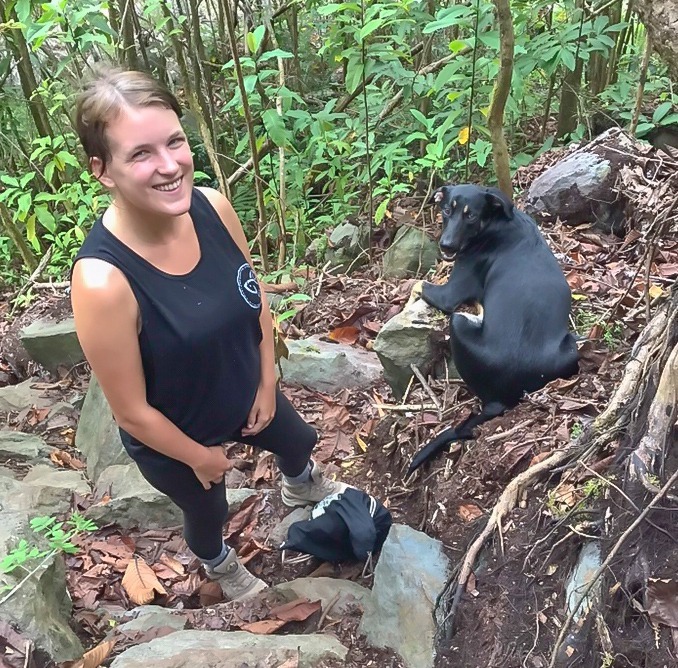 I was determined to find a volunteering opportunity during our travels in South America and happy to go almost anywhere as long as it was with animals and without cost. There were a lot of volunteering opportunities with animals I had discovered on the internet, but there were only two without cost: Rescuing turtles on the beach of Uruguay and AmaZOOnico, a project to rescue wild animals and reintroduce them into the wild if possible. 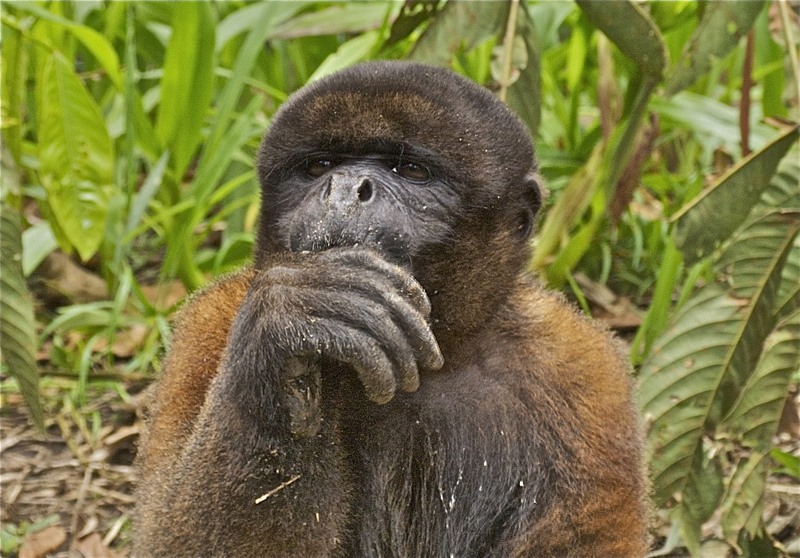 We preferred to work with various wildlife in the Ecuadorian Rainforest and luckily, our application was approved. It was early March when we arrived at our new home for two months. The volunteer house overlooked the river, where some young men and women were cleaning the kitchen while others enjoyed a read in a hammock under the trees. Our room was simple with two beds and a shelf for our backpacks. Netting in front of the window allowed us and a spider monkey, to assess each other suspiciously. Our work started early the next morning, carrying fruit and vegetables from the delivery boat up about 150 steps to the storage room, where we subsequently chopped some of it for the morning feed. A rotating schedule made sure that every volunteer had an ever-changing list of tasks including feeding and cleaning cages. When the veterinary needed help the experienced volunteers, who stayed for a whole year, helped out. An important task was also to guide tourists and tell them about the animals and the rescue project to raise funds. Although nesting turtles can be found in most tropical regions around the world, some of the waters in Costa Rica host a true phenomenon; the Arribada! This spectacle is when hundreds of Olive Ridley turtles come to nest on a single beach over the space of a few days. Because of human exploitation and global warming, there are only a few places around the world where this can still be seen. The Camaronal Wildlife Refuge is one of them. For my university placement, I was fortunate enough to spend a year monitoring turtles at the Camaronal (one of the perks of studying environmental conservation!). Although 5 species of sea turtles nest within this natural reserve, it’s famous for the thousands of Olive Ridleys which come to the beach during an Arribada. This only happens once every few years so if you ever get the chance to see one you really should consider yourself lucky! The marine reserve is secluded and away from the public so you have complete solitude with nature. 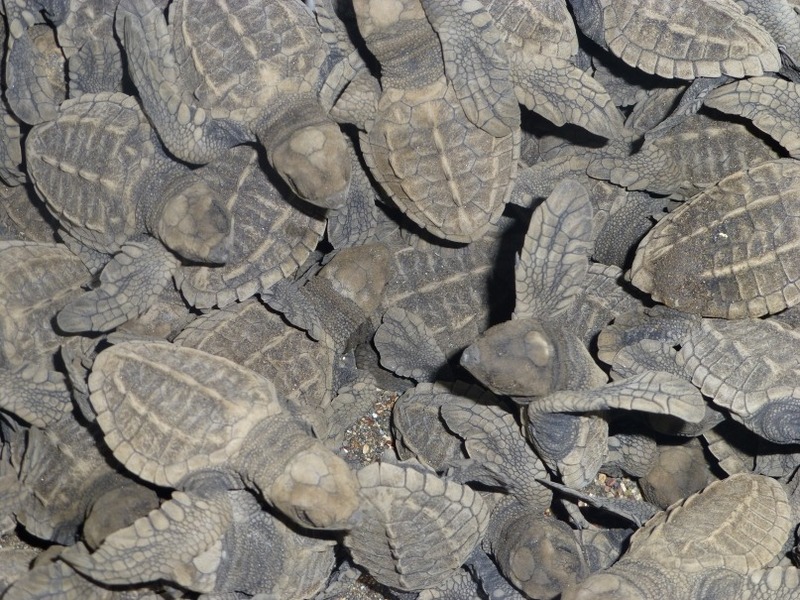 Each night or early morning I would either patrol the beach for nesting turtles or monitor the turtle hatchery. Whilst I was here I lived with a mixture of international volunteers, students and conservationists doing research, and local park rangers and villagers. Life was simple; we ate delicious yet basic Costa Rican food which we cooked together, all chores were shared, and we lived in a big dormitory. To this day, one of the most incredible experiences of my life was witnessing the Arribada. Nothing can prepare you for seeing thousands of incredible animals crawling onto land at the same time. I also got to lie next to a Leatherback turtle as it laid its eggs, which was unforgettable. If you are interested in marine conservation then I would definitely recommend turtle monitoring programs. This experience was organized directly with the Camaronal Wildlife Refuge to work as a research volunteer. I believe there are volunteer companies which can organize placements in the region but you should do your research before you pick one. Many big volunteer companies can actually have a negative impact both socially and environmentally. If you are looking to volunteer abroad then make sure you do some research on the company to check it’s an ethical organization! Unfortunately, there wasn’t a specific program I used. As it was through my university, I contacted the marine reserve directly and negotiated with them. It was recommended by one of the staff at the university as they had a contact there. While studying abroad at the University of Adelaide, I volunteered for a short time with Conservation Volunteers of Australia. I and a group of about seven other people helped with GPSing Southern Hairy-nosed Wombat warrens (or burrows). Conservation Volunteers host volunteer programs and getaways that allow volunteers to contribute to local conservation throughout Australia and New Zealand. The programs range anywhere from one day to multiple days to long-term commitments, generally assisting with research studies to collect data (such as what I did), planting trees or plants to rehabilitate an area, building walking trails, rewilding species back to rehabilitated areas, and more. Conservation Volunteers now has more than 2,000 projects completed each year. Our wombat adventure began at Brookfield Conservation Park, and it was as magical and educational as it was comical. 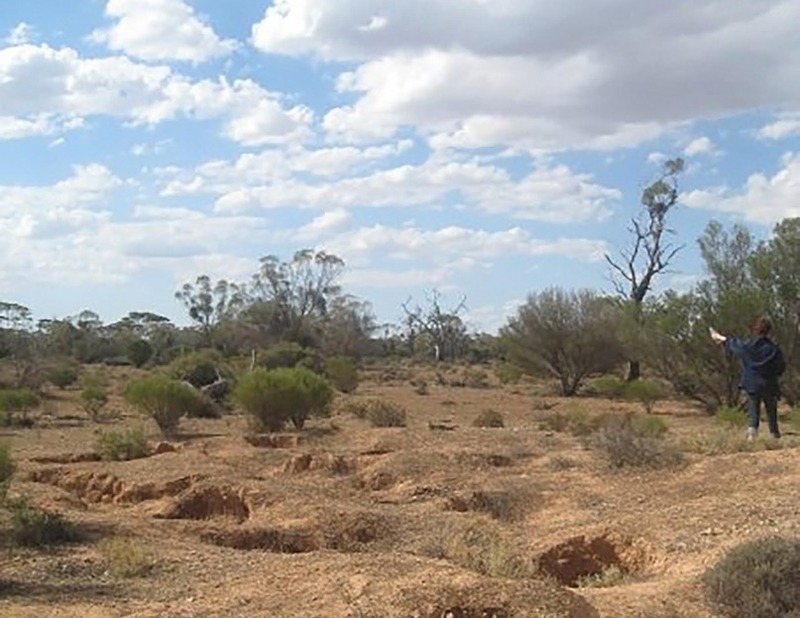 We learned about using GPS devices to log locations of wombat warrens, identify vegetation surrounding wombat warrens, and assess whether a warren was currently in use or not. All of these data were given back to researchers aiming to document long-term species survival plans for the wombats in this region. Our first order of business was to make sure we were prepared to go into the field, and our guide informed us about the importance of a proper hat – one that flopped over the ears and back of the neck to prevent sunburn and overexposure. Australia’s sun is VERY hot, so he knew what he was talking about! Needless to say, our baseball caps didn’t cut it for him. The incredible diversity of wildlife and birds we would spot during our surveys made the day that much better – we saw red and gray kangaroos, emus, many varieties of birds and insects, and, yes, wombats! I also saw more stars at night than I’ve rarely seen in my whole life. 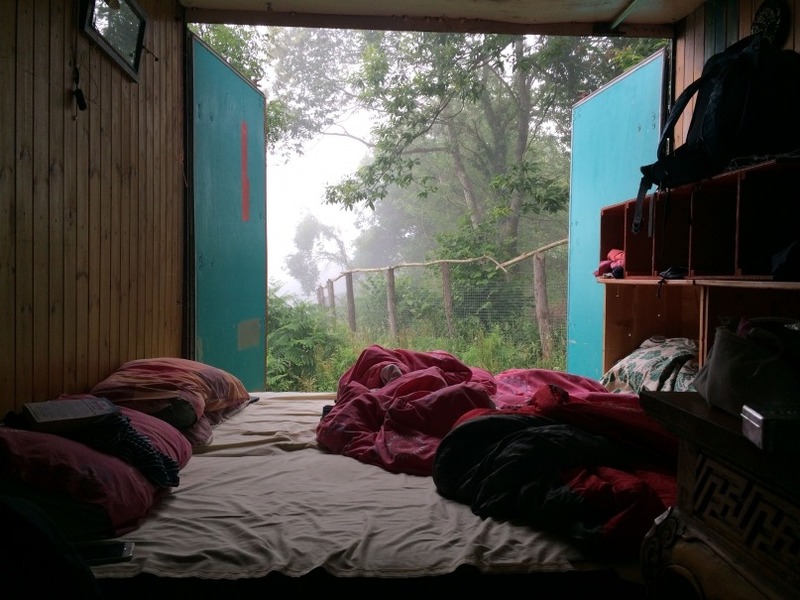 Our accommodation was minimal, but looking back on it, it actually prepared me for the types of accommodation I would later have in my career doing bird surveys. The kitchen was outside, covered by a large metal sheet, and we slept in bunks in an attached trailer. This would have been great, apart from the spiders… and if you’ve ever watched a documentary on Australia’s wildlife, things get interesting REALLY quickly when it comes to their creepy crawlies. There’s an extreme sense of comradery that you get when working in the field on conservation projects – you can learn to laugh about the smallest things. Of course, your companions can make all the difference in the experience. All in all, I would recommend Conservation Volunteers to others looking for conservation volunteer experiences in Australia and New Zealand! Volunteering on Galapagos Island is a great way to learn about the unique and fragile ecosystems throughout the islands while reducing your expenses. As we all know, the Galapagos isn’t famous for being budget-friendly. The Jatun Sacha Foundation biological research station in San Cristobal accepts short or long-term volunteers for a small fee in exchange for accommodation and food. One of the main problems on the Galapagos Islands is the introduction of non-native species. To help with this problem, the foundation focuses on long-term programs for the eradication of invasive species and the promotion of sustainable agriculture on the islands. Daily tasks include seed collection, maintenance of trails, data collection, and various projects in different areas of the station. Long-term volunteers also have the opportunity to create their own projects. As part of your stay, the foundation staff will lead volunteers on destination hikes to nearby lagoons, native forests, beaches, and local villages to explain the ecological and human dynamic of Galapagos. The accommodation at the station includes two houses (containing 11 rooms each) and resting areas. The houses are rustic, with room for groups of up to 45 people. The reserve has electricity, but there is no Internet or telephone access. Volunteers get three meals a day and the quality of the food is excellent, as the station has vegetable and fruit gardens that are picked for consumption. The station is a 45-minute drive from the main town of San Cristobal, and volunteers have free time on the weekends to visit other parts of the island. I really enjoyed my experience volunteering at the research station. It was a great thing to do before traveling through the rest of the islands as it allowed me to gain a deeper understanding and appreciation of the wide diversity of flora and fauna that can be found throughout the islands. Volunteering at the Uganda Wildlife Education Center (UWEC) for a month was a unique and unforgettable experience. Also known as the Entebbe Zoo, it rescues wildlife of all kinds from all over the country. The center doesn’t, unfortunately, have rehabilitation programs or staff trained in this area, so the animals become citizens of the Wildlife Education Center. But “zoo” is a bit of a misnomer — all of the animals were rescued from abusive, abandoned or orphaned situations, they are not bred or sold. Though I came for the opportunity to work around animals, I learned so much more than just about them, both good and bad. When I tell people I worked at a zoo, they usually ask me if it was like the Denver Zoo (a very modern zoo in my state in the USA). I have to laugh, for I don’t even know where to begin. But the short answer is, “no!”. For one example, the electricity does not stay on in Entebbe reliably enough every day to keep an electric egg incubator running. So instead, staff researched how to mimic the temperature of a nest using sand in barrels (trying to hatch chickens). Or when a naughty baboon bit a hole in a hose, there was not a spare hose nor glue or tape to patch it. So instead, they cut a strip off a rubber glove and tied it around… cut it with a knife, because there were no scissors anywhere in the UWEC. While I mourned the deep lack of resources in this Third World operation and other issues such as sketchy management, I personally enjoyed being around the ingenuity of the zookeeper staff every day, and they were very welcoming to me as a volunteer. Naturally, though, I most enjoyed the animals. 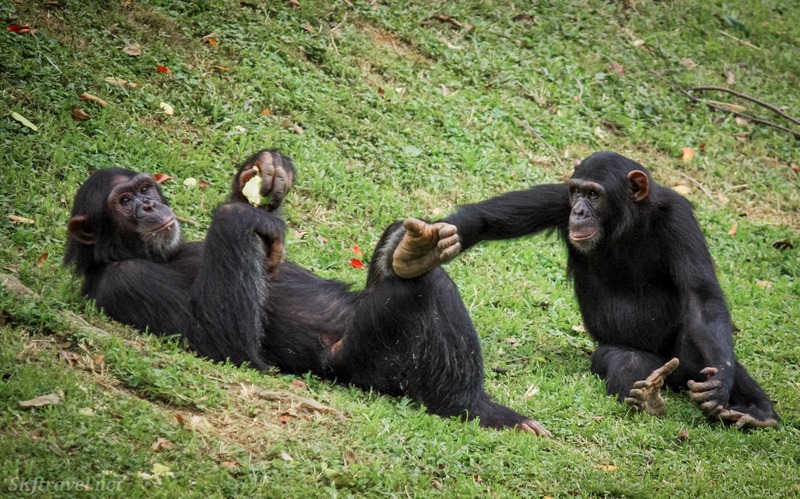 Especially the chimpanzees, whom I fed porridge in the mornings before letting them into their daytime island habitat, and cut up staggering amounts of fruits and vegetables to throw across the moat for their lunch. I learned so much about their behavior just watching them each day. It wasn’t all cute and cuddly mammals we had to deal with… I quickly had to conquer my abject fear of snakes when a 15-foot dehydrated and malnourished python arrived! And by the way, I never would have known this creature was in ill health until we took it to the snake house and compared it with the size of a healthy python! So I learned something even about animals I fear. I lived right on the grounds of the UWEC in a two-bedroom flat and worked most days. I loved walking past the marshy shoebill habitat at night and the symphony of frogs, insects and birds was gloriously deafening. I ate most meals at the cafe, right on the shore of Lake Victoria. A troop of vervet monkeys roamed the grounds, and though they could be pesky, I loved photographing them. Although I saw and experienced both good and bad things, I truly wouldn’t trade my time there for the world. OMG, I’m the Cat Lady of Cyprus! This is the story of how the 2 cats that came with my little stone rental cottage suddenly multiplied to.. are you ready…800! They’re everywhere; every color, every size, and every type. Be careful walking so as not to step on a tail. Shuffling is safer. Actually, all these cats are not at my cottage. They are at the Tala Monastery Cats in Ayios Neophytos Monastery in Tala, Cyprus, where I am one of a team of volunteers. As a nomad who lives in a new home every 3 months, I connect with each new community through volunteer work. On Cyprus it made sense to work with the Tala Monastery Cats because Cyprus has many thousands of stray cats, a population expanded from hundreds brought to the island many years ago to rid it of snakes. Find out more details about this phenomenal group and watch the video on my Nomad Dancer vlog. 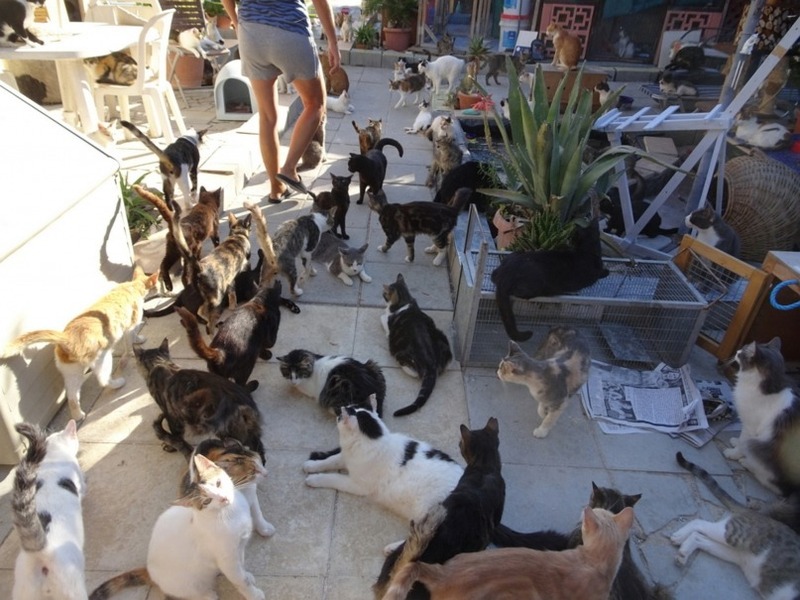 In 2012 Tala Monastery Cats opened with 78 cats in a natural outdoor setting in the hills. It now houses over 800 and counting. In the space of a few hours we feed every one of the cats wet food & then dry (all donated), wash down the entire outside area, fill countless water bowls, clean out every cat bed and sweep every sleeping area, clean & mop special enclosures that protect kittens, new cats to the haven awaiting spaying, neutering or vaccinations, mothers and nursing babies, and ill cats. This is done every single day, in addition to rescuing new cats that are too often dropped off outside, working with the local vet, fund-raising in the community, collecting donations, and adopting cats out to new homes. Every cat is cared for and cared about. A special memorial honors each cat that has passed away. The day I started working there, a tiny kitten, rescued from the car park, could not be saved. The love and care it was given, holding and wrapping him up carefully, says it all about the people who run this incredible organization. I am the Cat Lady. At least that’s what if feels like. In reality, I’m the volunteer lady among a tight team of dedicated people who make this exhausting job fun and who clearly care deeply about the cats in their care. I was one of those lucky champs who got selected to volunteer at the first film festival at the IMF, India. IMF stands for Indian Mountaineering Foundation, situated in New Delhi is known to conduct advanced courses in mountaineering and training of young graduates and athletes. The institute accepts film shows and documentaries from eligible artists and cinematographers that were scheduled to telecast in Feb 2018. The film festival went on for two days and awards were given to top performers in the event during the evening hours. The IMF demonstrated their ability to showcase the films in an authentic and loving manner which was the eye-catcher of the event. There were approximately 10 volunteers for the event who helped in arranging everything and aiding guests and athletes who were present during the activities. The highlights of the event were skiing and snow gliding shows and the movies that were selected by the judges. Around 500 movies were showcased on the big screen in the two days out of which only 10 movies were awarded cash prizes and medals. 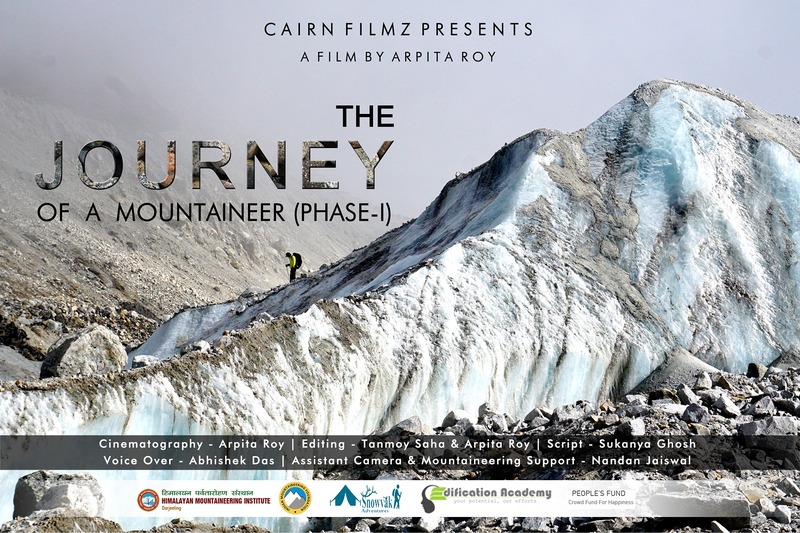 It was an enriching experience for me to have attended the first mountaineering film festival organized in the country which was given the tagline ‘Adrenaline meets Art’. I’ve always been apprehensive of volunteer tourism due to the possible negative effects. However, in early 2017, I felt an urge to make a positive contribution toward the refugee crisis in Europe. Before deciding the location and organization to volunteer with, I considered the environmental impact of my travels as well as what skills I could provide. Although there are many camps in need throughout Europe, I chose to volunteer in the north of France. As I was based in Spain, it would mean less environmental impact than traveling to Greece or Turkey. There were a few non-profit organizations based in Calais and I saw that another blogger had been volunteering with Help Refugees. Their website provided a lot of helpful information and an application form for volunteers. After completing the application process and being accepted, I then had to source my own transportation and accommodation. Luckily there is a Facebook group for volunteers in Calais to help them organize car and room share. Many people come down from England and will often carpool together. The best options for me were to go by bus and pay to share a room at a local volunteer’s house for the week. Upon arriving I didn’t really know what to expect. And honestly, the orientation process for Help Refugees volunteers is non-existent. The website makes it look like there will be regular team meetings or activities, but I only attended one related to health and safety on my fourth day. Originally, I had applied to sort donated clothes but was told they needed help in the kitchen which was run by another organization, Refugee Community Kitchen (RCK). I didn’t mind but was worried about my lack of cooking skills. 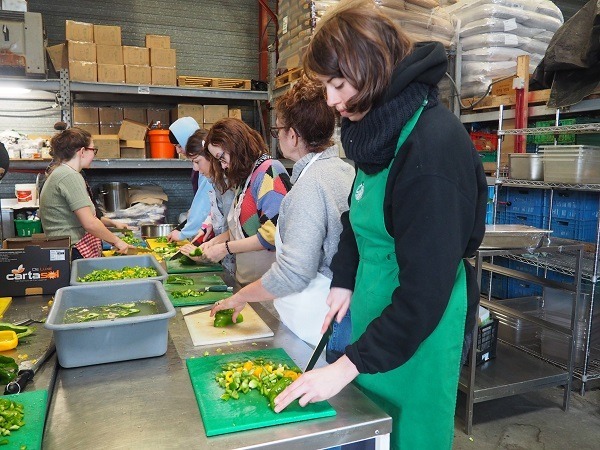 However, these are not necessary as many of the volunteers were put to work chopping vegetables under the direction of professional chefs. In addition to preparing the meals to be delivered to the refugees, they also had small teams go out to the in the Grande-Synthe Camp. It was a sobering sight to see armed guards in front of a forbidding fence enclosing around 2000 refugees who were desperate to cross into England to seek asylum. It was a strange feeling to serve food to someone who tells you that they were a chef in their homeland. The situation was very desperate with many not even having their own space to sleep, taking naps in turn within the common area. Worse still, just a week after I finished my week of volunteering, the camp was burnt down and never rebuilt. Despite this fact, there are an estimated 1500 refugees sleeping in the nearby forest who still need assistance with donations of clothing, money, and time. 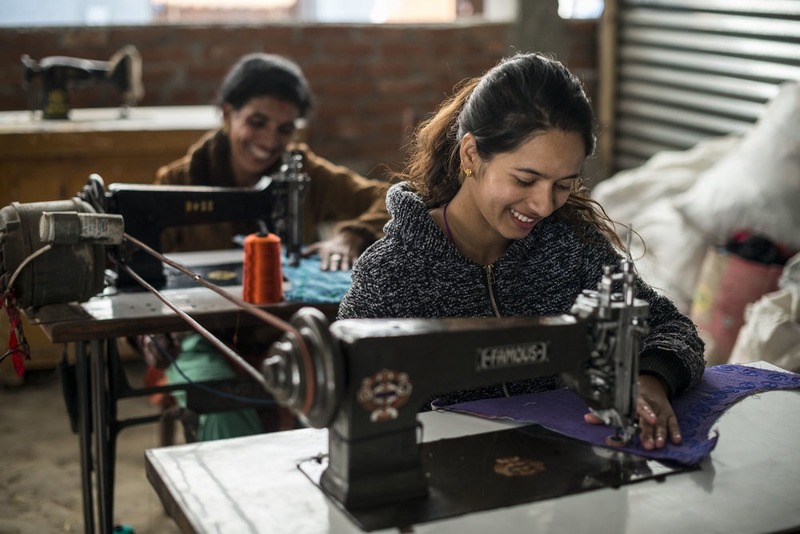 One late evening in March as I browsed through Workaway, a platform that connects travelers with volunteer opportunities abroad, I saw an opportunity to work with a women’s development organization in Kathmandu that advocates for fair trade. I had always been a huge advocate for fair trade and sustainable fashion, having volunteered for 2 years as a freelance journalist for the World Fair Trade Organisation, so this experience stood out to me amongst the rest. It was this online encounter through Workaway that would lead me to meet Nasreen Sheikh, former child laborer, women’s rights activist and global changemaker. Those three months in Nepal may have been one of the best three months of my life. In the following weeks, I would make connections with various people; connections that I would realize were not a coincidence. Each connection, each meeting, each conversation was a lesson. My newly found connection to the universe and to my own soul was slowly peeling away the layers of distractions that had buried me for so long, to no knowledge of my own. I felt as though I’d dropped into an alternate universe, like Alice down the rabbit hole. I spent the next three months with passion wrapped around me, connecting people and connecting with people, and working with Local Women’s Handicrafts through their business development. Soon after, upon my return to Australia, I decided to continue supporting the women by starting up a social enterprise that would assist as a supply chain for Nasreen and the women. 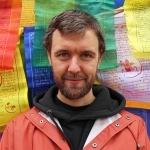 I now run the social enterprise from Sydney, promoting the concept of fair trade and raising money for future development projects in Nepal. In July 2017, I set out for a one year opportunity in Vietnam with the UN under the United Nations Volunteer Program. The program is highly competitive and volunteers receive a stipend to work in various countries all over the world. Prior to being selected, I had undertaken a four-month internship with UNESCO in Bangkok and this experience had helped me gain entry. Spending a year volunteering with the UN in Vietnam was a truly incredible experience. When a lot of people think of working in the UN they imagine taking part in a lot of field work but my position was more office based. My role involved working on sexual and reproductive health matters in the country. For example, the UN agency I was working for, UNFPA – United Nations Population Fund, carried out a study on access to maternal health care among ethnic minority communities. I really enjoyed working at the UN. Working at the UN is like working anywhere and your experience there depends a lot on who your colleagues are. My colleagues were mainly Vietnamese and were friendly, supportive and always had lots of energy and ideas. In the wider UN office, there was a great mix of Vietnamese and international staff so I also made lots of great friends from all over too. Outside of work life, I felt extremely blessed to have the opportunity to live in Vietnam. Hanoi is a hectic and interesting city with lots of great restaurants and bars. During my time there I also had a great chance to travel around the country. I traveled to some of the more known tourist destinations such as Sapa, Saigon and Hoi An. But given that I had more time in the country I had the chance to visit less known but outstandingly beautiful places such as Pu Luong and Ninh Binh. Overall I had a fantastic experience as a United Nations Volunteer in Hanoi. I planned my trip to Perú way ahead of time because I wanted to hike the Inca trail, the sacred path to the worldly famous Citadel of the Machu Picchu. I managed to take three weeks vacation and I wanted to explore other areas of Peru as well. However, my planning skills brutally failed me this time, as I didn’t plan anything else other than the Inca trail, just because it was a necessary procedure in order to avoid being left out. Little did I know that the lack of an organized itinerary turned out to play in favor of another opportunity that was waiting ahead for me. During my trip to Cuzco I kept bumping into people who were going there to do voluntary work, so I decided to ask Google if there was any chance I could do the same while I was there. How cool would that be? I had a few days in Cuzco before setting off for the Inca trek so that I could acclimatize to the altitude. I was wondering around the beautiful city with a terrible headache and short of breath. It’s almost 12.000 feet, so I couldn’t expect any better from my body. So, while I was taking it easy and relaxing in one of the cozy cafes, I decided to have a look online and see if I could have joined a charity association and work with kids. There were thousands. I chose the one that felt a good fit for me, and after a few email exchanges, we decided that we could go ahead with my registration. I had to provide some references since I couldn’t have the police record they were asking for, and 900 USD upfront payment for the 2 weeks of volunteering which would cover also my accommodation and a simple breakfast. I am questioning now if it is fair to pay for volunteering. All the work we put in isn’t enough? But I leave this discussion for another post. I was excited that I could do my bit and look after less fortunate kids. While I was having an amazing time hiking the Inca trail I was even more excited about the voluntary experience that was waiting ahead. When the time had finally come, I was introduced to my friendly co-workers who also helped me to understand how the center worked. Every afternoon we would take the bus to Oropessa, the small village where the school was located, 40 minutes from Cusco. The project was intended to look after 30 kids in their after-school activities, helping them with homework, teaching English, math and art. The school had 2 paid professors who would teach the kids math and history, while we volunteers would take care of the rest. I don’t think my presence really made an impact, as we were a lot of volunteers for the number of kids. However, I enjoyed assisting the classes and helping the kids with their homework or playing with them during the breaks. It was a great experience which I repeated later on that year in Africa. However, it triggered a few questions to which I still have to find the answers. How good are we doing to those kids, for real? We get to know each-other, give them love, and some teaching and we disappear after 2 weeks or 1 month. How good or bad does it affect the learning process and what about psycologically? Wouldn’t they feel abandoned? And more, how real is the “no-profit” part in these so-called NON-Profit associations? And how many are a scam? I intend to dig deeper. In the meantime, I will keep doing my bit, just in case. Back in 2015, my partner and I were traveling around Europe. We’d been recommended Angloville by some friends and thought it sounded like an excellent way to travel and volunteer at the same time. Angloville is an immersive English language programme. All the volunteers are native English speakers and the participants are from the country the programme is hosted in. For a whole week, you stay in accommodation (usually somewhere beautiful out in the countryside) and talk in English with the participants. All of the participants are adults and the week is spent talking to them in English, teaching them and helping them to learn and develop their English speaking skills. As a native English speaker, it doesn’t feel much like teaching, but you need to help the participants with their common errors and pronunciation. You are partnered up with one person who you chat with regularly and help them to create a presentation which they will make to the group at the end of the week. It’s about making them feel confident as many of them will use English for business. The week can be tiring as you are constantly talking and surrounded by people. However, it’s so rewarding at the end of the week when you hear the difference in the participants. 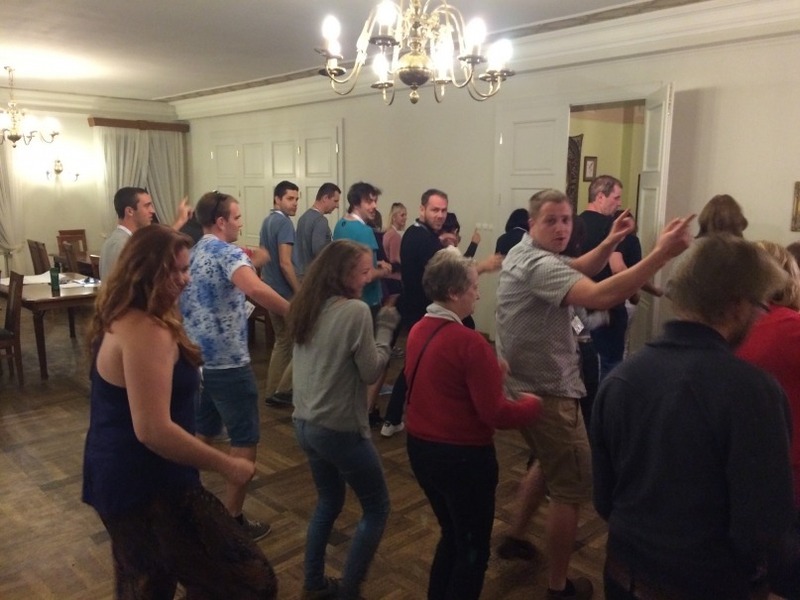 We had the pleasure of doing four Angloville courses; three in Poland and one in Hungary. There will usually be between 20 and 50 people on the programme. You make very strong connections and friends which is why it’s such an amazing experience. We visited many of our Polish and Hungarian friends after the course, as well as native speakers from our home country of the UK and friends from the USA. If you’re a native English speaker, love being around people and would like to try teaching English, I highly recommend volunteering with Angloville. Find out more about my first Angloville experience. I spent six weeks volunteering as a Yoga teacher in Mauritius in early 2014. I was there as part of a health project called “Get Healthy Mauritius”, aimed at increasing the awareness about health and nutrition among kids in schools and orphanages. The project had been organized by the Mauritius chapter of AIESEC and about a dozen volunteers from various parts of the world had come together for this. I made some amazing new friends in our volunteer group, some I’m still in touch with. Young people from Jordan, Australia, China, Brazil, Portugal and Argentina getting together for a volunteering project had to lead to some interesting connections and lots of funny anecdotes over the course of 6 weeks of work. The project consisted of visiting an assortment of schools and orphanages where we conveyed nutrition and health factoids through games and class discussions. Being a Yoga teacher from India, I was tasked with teaching the kids Yoga. But the kids spoke only French, a language I knew not a word of. One of the Mauritian students who was part of AIESEC Mauritius was kind enough to volunteer as my translator and that made life simpler as I taught there. Soon it became obvious that language was hardly a barrier, given the absolute enthusiasm of the kids. Mimicking every little action of mine (even when I tied my hair!) they made verbal instructions redundant. I’ve yet to teach a bunch of adults who can sustain that level of energy and enthusiasm through an entire session. This will always be one of my fondest memories. AIESEC is an organization for students, under the age of 30, to volunteer or work abroad. Programs can range from paid to internships to volunteering which can include accommodation, food, and transportation. There is a catch though, in the form of a program fee which can range from $500-$700 excluding flight costs. My experience with AIESEC began when I got in touch with a member from my local organization who in turn showed me options of where I could volunteer (that was my interest at the time). She suggested I teach English in Taiwan as she had done that a few years prior and had a fantastic experience. Taiwan never really crossed my mind as a place to visit, but I thought hey, why not, let’s do it for the experience. My interview for the position with an AIESEC member in Taiwan, over Skype, was well received and I was approved. I paid my fee and booked my flight ASAP. Upon landing in Taipei, Taiwan, I was greeted by an AIESEC member who met me at the airport. She guided me through the HSR (high-speed rail aka bullet trains) and buses from the airport to the city where my school was and where I’d stay. Once there, my school principal picked me up in his car and drove me around to show the city and take me to my first host family (I stayed with three families throughout my eight weeks of volunteering). Teaching English was an excellent experience and interacting with children from a different culture made me realize that children, in general, aren’t so different after all. My host families were very attentive and hospitable and I found the school to be receptive to my needs and well-being. Although a bit more on the expensive side, AIESEC is a reputable organization that I recommend volunteering or working through. Volunteering in disaster response may seem like an intimidating and somber undertaking, but it can be an incredibly rewarding way to give back while traveling. I have spent two stints volunteering with All Hands and Hearts, a disaster relief organization that addresses the immediate and long-term disaster recovery requirements of communities reeling from the destruction caused by natural disasters. My first time volunteering with All Hands was in 2010 in Léogâne, Haiti after the massively destructive January 2010 earthquake. After identifying that rubble removal was one of the most pressing needs in the hardest-hit community of Léogâne, All Hands put volunteers to work clearing away earthquake rubble from people’s lots so they could receive sturdy transitional shelters to live in while they rebuilt their crumbled homes. It was hard, physical work but finally clearing a slab alongside fellow volunteers was immensely rewarding. 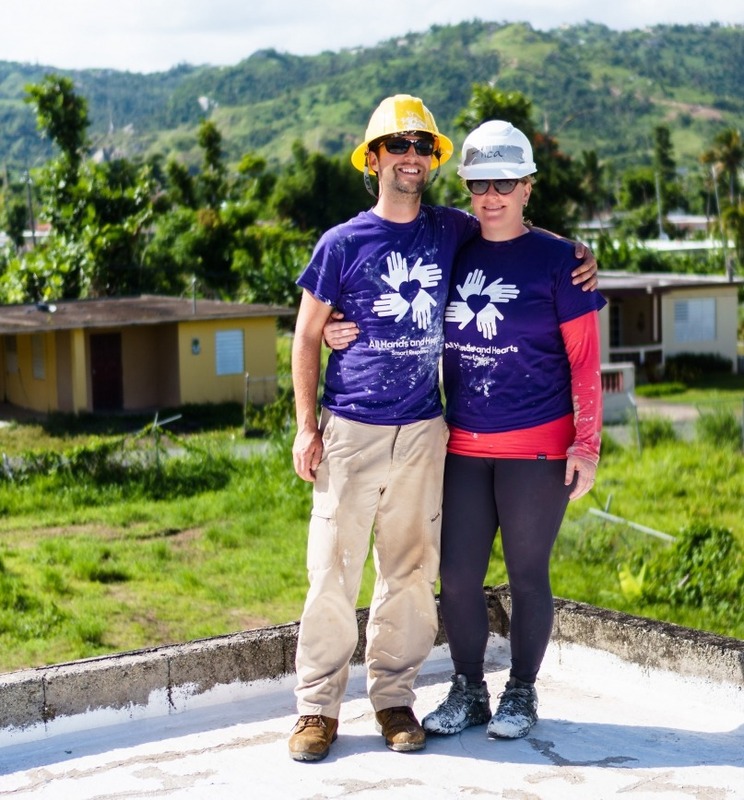 Most recently, in May of this year, my husband and I volunteered with All Hands again in Yabucoa, Puerto Rico where Hurricane Maria wreaked havoc in September 2017. Many people’s roofs were destroyed by the storm’s staggering 175mph/280kph winds which allowed moisture to seep inside and cause mold to grow in their walls making their families sick. For this ongoing project, volunteers are put to work resealing damaged roofs, clearing debris, and sanitizing the inside of people’s homes to remove mold. It too is demanding work, but equally fulfilling. In addition to the work being incredibly worthwhile, I find that it is always the people that you meet during a volunteer stint with All Hands that stay with you the most. Whether it’s a grateful homeowner who invites you over for some home cooking, or a fellow volunteer with whom you sweated under the sun, the friends you make while volunteering All Hands friends are friends for life. Find out more about volunteering with All Hands and Hearts in our blog article. 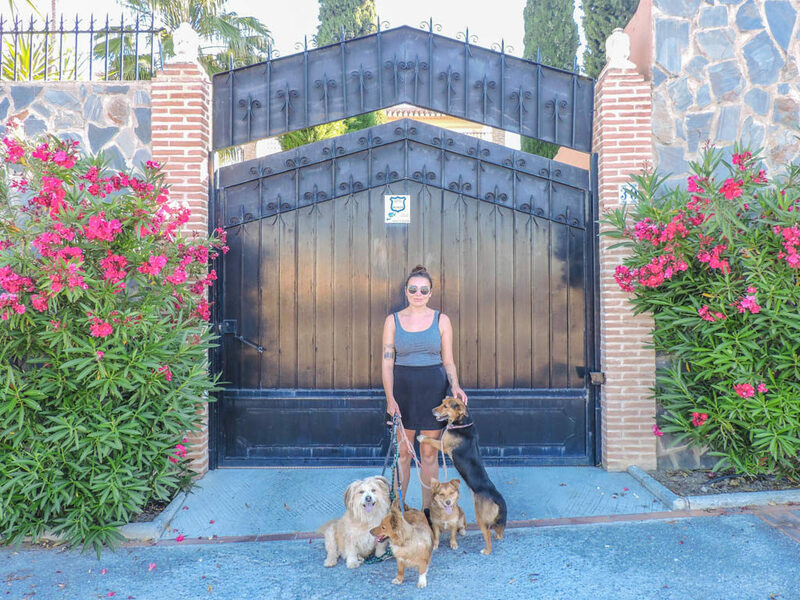 When you hear the words truffle farm and Spain, you might picture a fancy mansion with acres of land with evergreen oaks neatly lined up. It’s more or less what I had in mind when my girlfriend and I set off to the tiny village of Torazo, North Spain. We found a volunteering opportunity through WorkAway and decided to break up our 6-month world trip with 2 weeks of manual labor. When we arrived, we found a completely different scene. We were greeted by a family of 6 living in a self-built house overlooking a valley. This wasn’t where we would stay, however. About a 5-minute walk from the house was the field, and at the top end of it stood a stationary truck which was turned into a living space. There was no power, apart from a single solar panel with a cigarette lighter outlet, the kind you find in cars. There was no shower but there was running water and a sink. There was a hob with a gas bottle attached to it. Your daily duties had to be taken in the compost toilet outside. Our day would start around 9 am, where we would make breakfast with the ingredients provided by the family. We would get our tools ready, get into our baggy clothes (also provided by the family) and head into the field. At first, the holly oaks that would one day provide truffles were completely overgrown. They were planted in neat rows, but they were invisible due to the high grass. Our job was to weed the soil around the trees and stake the tiny trees that needed it. Our host Adam would drive around in his tractor, cutting down the grass at the same time. There were around 250 trees and we would usually stop at around 2 pm, which is when we would receive a home-cooked lunch together with their 4 lovely kids and 2 lovely dogs. It took us the full 2 weeks to do the weeding, staking, scything and dragging grass off the land. While it was hard work at times, especially when the sun got on our heads, we enjoyed it immensely. It’s liberating to temporarily reprogram your lifestyle to have less of the constant stimulation you get in cities. As I sit behind a desk in my job, the farm life felt like a welcome change. We really felt part of the family and loved playing with the dogs, the kids, and feeding Ziggy and Rosa, the 2 pot-bellied pigs they kept. It was extremely rewarding to take a break from the chaos and settle down for a simpler life, even when it was just for a short while. For maximum effect, I recommend doing something completely different than your day job when you plan to do some volunteering on the road. After spending a two week holiday in a five-star resort in Crete, we left feeling a little deflated. The holiday itself was perfect – all-inclusive food and drink, entertainment each evening, the beach on our doorstep, except something was missing. We left feeling as if we hadn’t seen “real Crete.” We hadn’t learned a single Greek word except Ouzo and the most local food we’d tried was the Greek yogurt at breakfast. After that, we swore never to go on a package holiday again and instead we’d only board a plane if we were actually going to learn something. Thankfully we discovered Workaway – an online platform where hosts offer food and accommodation in exchange for 25 hours (approx.) of volunteering a week. There are hosts from over 170 countries, from surf instructors in Portugal to our dream – working on an olive farm in Crete. We immediately signed up, ready for our true taste of Cretan life. Baring in mind, I came from a job in London working for a global fashion brand and my boyfriend was an engineer in the oil industry so we had zero clue about farming, never mind communicating in Greek. We cannot deny, it was a shock to the system. The romantic vision of sunshine, filled farming was, in fact, sweaty, hard labor with the bittersweet reminder it is unpaid. However, you are rewarded with incredible food, free accommodation and made to feel like part of the family. It was an incredible feeling watching our olives go from branch to bottle. It was, however, not so incredible trying to squeeze liters of the stuff in our backpacks to take home to Scotland. Although we firmly decided farming life was not for us, we were hooked on the idea of living like a local instead of the confines of a resort or hotel. Even in hostels, despite being surrounded by other travelers therefor you only hear a touristic point of view. With Workaway, you immerse yourself in a new language, dance to their music and dine in their hidden gems that you can’t find in a guidebook. We have since completed a Workaway experience helping to run a glamping site in Switzerland (where we stayed in a luxury tree house) and on Oahu, Hawaii assisting photographers with childcare and planning their round the world trip. You can read from our Workaway review how those experiences went. 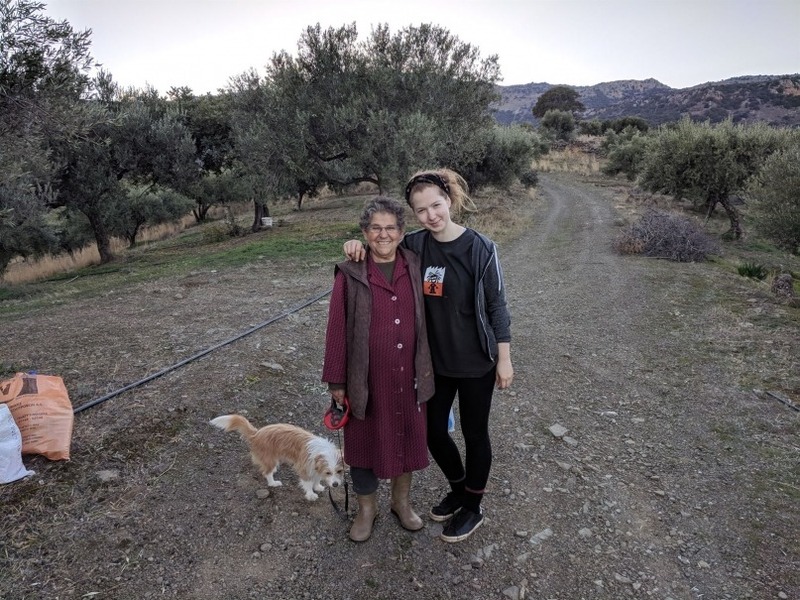 Although we originally viewed volunteering with rose-tinted glasses, there were days on that farm with olives raining down on us where we didn’t know whether to laugh or cry. However, we stuck it out and we made friends for life because of it. We now also know more Greek than just the word Ouzo. 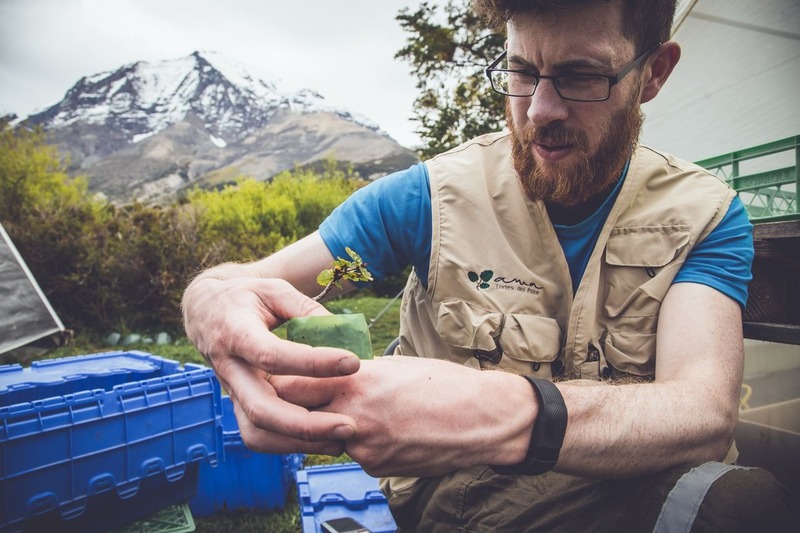 After our 7-day hike in Torres del Paine National Park, we were offered the opportunity to volunteer in the park as part of the project “Agrupacion Medio Ambiental”, often referred to as AMA. This program was created by the owners of the private section of Torres del Paine as a substitute to the Conaf, a national organization funded by the Chilean government. AMA Torres del Paine is in charge of monitoring and maintaining the private areas of the park which are visited by more than 200,000 visitors per year. However, its main focus is the reforestation of the park and the creation of preventive programs about the local ecosystem that can easily be threatened with the increase of tourism in the area. We joined Ama and its reforestation team for a couple of weeks while some of our friends took over the role of park rangers. As part of our duties, we looked for young “Lengas” plants in healthy forests and replanted them in areas affected by forest fires. In fact, following the massive fire in 2011, 40,000 acres of Lengas forests, which host most of the park wildlife, have burnt and cannot regrow naturally. This native tree of Patagonia that only grows on average 1 cm a year, must be reintroduced manually. During our time in AMA, we learned a lot about Torres del Paine and the relationship between the state-run national park and the private side we were volunteering for. We had a lot of issues mainly with conflicted management and lack of organization. However, since our time as volunteers, the program has evolved and volunteers are now only accepted for a minimum of 30 days for a fee starting at $900. We think this must have had a good impact in terms of continuity and appropriation of tasks. We could also notice an improvement on their website, their social media and the different programs offered. By the looks of it, things seem to have been redesigned and the management changed. 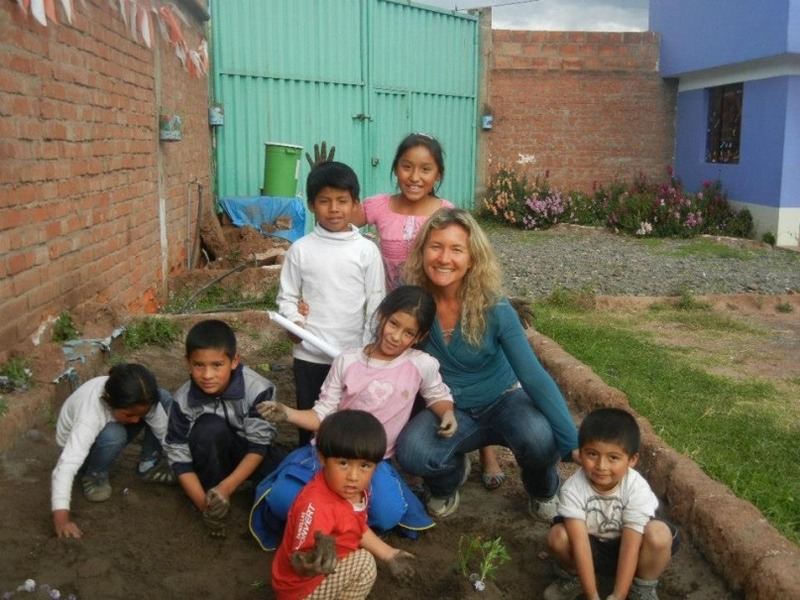 To learn more about Jenny and Steven’s Experience check out their article about Volunteering in Torres del Paine. In May 2018 we visited Brazil and decided to enrich our travel experience by volunteering. We were coming from Bolivia and had a long ride towards the beach with not many interesting tourist spots in between. Therefore, we chose one of the biggest agriculture regions of Matto Grosso do Sul to be the first destination of our volunteer experience. I found several opportunities on the WorkAway website and eventually decided for what was presented as a small farm run by a guy called Pedro. With Pedro we agreed on staying for 1 week, as he just started a new project and didn’t know how much time he would have for us. Eventually, we stayed a few days longer and were very sorry to leave, as we became good friends with him. Life on the farm was very nice, work was not hard and we very much liked escaping the online world of our computer-related job to put our hands in the soil of his little garden. What did we do on the farm? We would work 2 hours in the morning and 2 hours in the evening, having time off during the hottest part of the day. 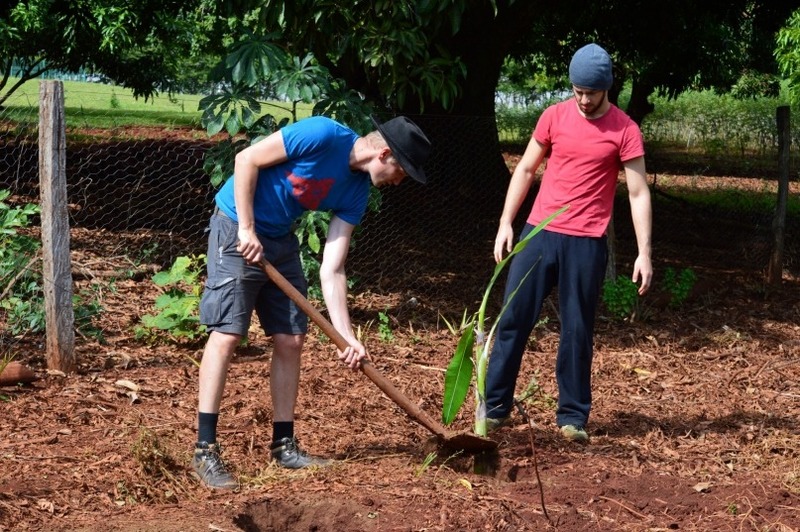 In the morning we worked in the small garden planting vegetable, pineapples, and banana trees. In the evening we did some lighter work – went to check the farm surrounding, harvested some corn and made cheese and a corn dish called pamonha. It turned out Pedro’s small farm was part of a very big farm of 900ha with 600 cows and loads of fields of corn and soya. Thanks to this, we were introduced to the work of the bigger farm as well. We were free to eat anything from the garden, including coconuts, and take eggs and fresh milk from the bigger farm which was right next to it. We also learned how to make cheese, which was very interesting. This week volunteering was honestly the best experience from our time spent in Brazil. Read more about our volunteering experience in Brazil. Back in 2016, I discovered a volunteering opportunity via WorkAway. I had a strong desire to travel to Alaska and I wanted to have an as genuine experience as possible. I spent months looking at all the different listings, trying to decide which one I would be best suited to. It turned out I spent too long searching, as by the time I had applied for my first choice, it had already gone. As had my second choice. And my third. In the end there was only one listing left that worked with my schedule. It didn’t sound quite as good as the others and wasn’t in my preferred location, but I was still very keen to go and help out. Ketchikan, Alaska was my destination – ‘Salmon capital of the world’. My host, Phil, picked me up from the ferry terminal. I would get accommodation and food in exchange for 4-5 hrs of labor per day. He needed help fixing up a battered, beaten and derelict old home for him and his family to live in. Phil described the nature of the task on the short drive to the site. It was a very niche job. You see, it wasn’t just one house, it was about five. Also, these houses were strapped to the top of a massive raft which provided structure and flotation. Phil was renovating an Alaskan Float camp. Spending long days working right on the water was a truly wonderful experience. During breaks, we’d sit and watch the Seals playing in the staggeringly deep water, Eagles soaring overhead and listen to the mischievous Sea Otters making homes under the floorboards. However, our working relationship started to break down. I had never seen a float-camp before, so although entirely willing, I was completely unable to work without direction. Phil had a lot of other situations going on at the time which required his attention. This was not a working arrangement that was going to flourish. We sat down, talked it through and both agreed that the current situation wasn’t benefitting anybody. As a solution, I suggested I pay rent for the rest of my stay as I had plenty of things that I wanted to see and do in the area. This certainly didn’t turn out exactly how either of us had hoped, but despite the issues, this was one of my richest travelling experiences.